Do you struggle to gulp down bitter green smoothies? Green smoothies don’t have to be bitter to be potent and effective! Instead of Kale, this smoothie uses a combination of sweet tasting Spinach supercharged with Moringa powder; the light tasting, next hottest superfood that puts Kale to shame. 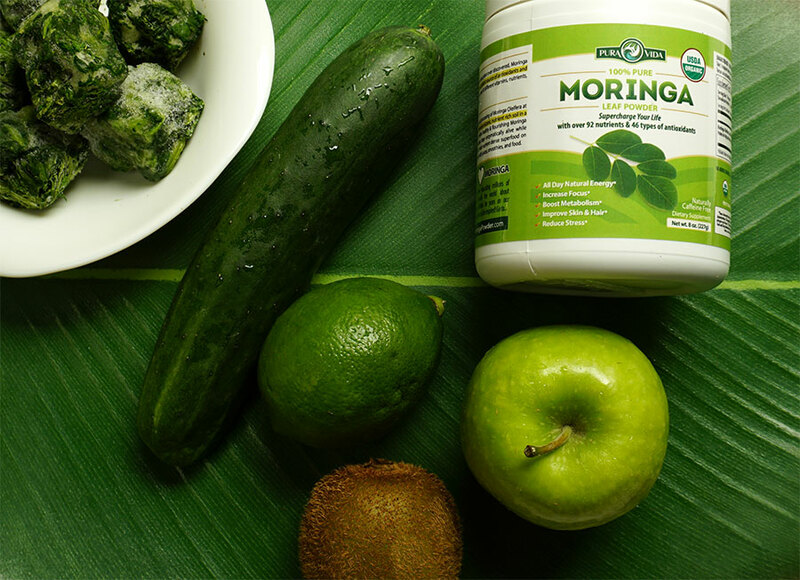 So forget the kale for a moment and pour a serving of moringa powder into a smoothie to reap its nutrient dense, immune-boosting, cancer-fighting benefits. –EatThis, NotThat! Detox smoothies like this one will help you lose weight, reset your metabolism, rejuvenate your skin from within, and a whole lot more. So re-energize yourself with this delicious & refreshing green smoothie Supercharged with Moringa Powder which adds additional weight-loss, sugar controlling, brain boosting, and inflammation fighting benefits. Eliminates harmful toxins, debloats and shrinks your waistline, and rejuvenates your skin from within. Reset your body with this detox smoothie. Turn back the clock and bring back your youthful glow! This smoothie is loaded with antioxidant vitamins and minerals that can help prevent wrinkles, hair loss, and inflammation which leads to puffiness. The cognitive enhancing nutrients in this Moringa supercharged smoothie enhance clarity of thinking, alertness, focus, concentration, memory, and even mood.